Brief：Kenya calls on business sector in Guangdong to cooperate with it to help fulfill the country's development agenda. The Kenyan government has called on investors from China's Guangdong province to set up enterprises in the East African country to help boost its development agenda. 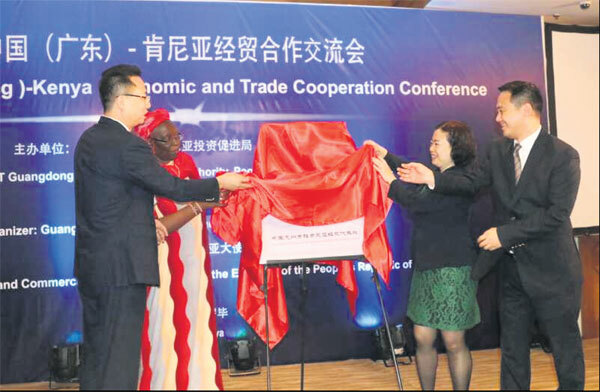 Speaking at the recent China(Guangdong)-Kenya Economic and Trade Cooperation Conference in Nairobi, Kenya's capital, Betty Maina, the principal secretary at the Ministry of Industry, Trade and Cooperatives, said her ministry was eager to collaborate with Guangdong province to enhance the country's production capacity. The opening of the Huizhou Economic and Trade Representative Office is marked in Kenya on Aug 3. "It is for this reason that the ministry signed a framework agreement with the chairman of China's National Development and Reform Commission on May 15, 2017, to strengthen cooperation in production capacity," she said. The objective of the agreement is to create a cooperation and consultation platform, aimed at boosting production capacity in industrial sectors that include special economic zones, electricity, oil and gas, railways, roads, ports, metallurgy, building materials, chemicals, light industry and textiles, agriculture and agri-processing, telecommunications, electronics, machinery and household appliances. Maina told potential Guangdong investors that enormous opportunities exist within the framework of Kenya's Big Four development agenda, which focuses on the manufacturing, healthcare, housing and agricultural sectors. "Efforts are underway to reduce the cost of power and logistics, among other factors that affect the business environment," she said. Moses Ikiara, the managing director of the Kenya Investment Authority, said Kenya wanted to emulate Guangdong's development prowess. "Guangdong province has been the top contributor to China's national economy for the last 29 years, with a GDP of $1.42 billion in 2017, accounting for 10.5 percent of the total," he said. Ikiara said Kenya was continuously reviewing its investment environment to ensure that businesses maximize their return on investment. "Kenya has modernized and simplified various legislation to make the economy more business-friendly, and has made considerable strides in reducing the cost of doing business. These reforms have seen improvements in literally all continental and international business climate indices," he said. Ikiara urged Guangdong investors to consider investing in Kenya by going into joint ventures with Kenyan companies or through public-private partnerships. "We want to assure you that Kenya is open and safe for business and investment. We have very attractive incentives, especially in export processing zones and (special economic zones). The Kenya Investment Authority commits to not only assist Guangdong investors in finding investment opportunities and finding local partners, but also provide them with the best, friendly pre- and post-investment facilitation," he said. Sun Baohong, the Chinese ambassador to Kenya, said China will continue to push forward the integration of the Belt and Road Initiative with Kenya's development strategies, particularly the Big Four agenda. "Kenya is now in its initial stage of industrialization. 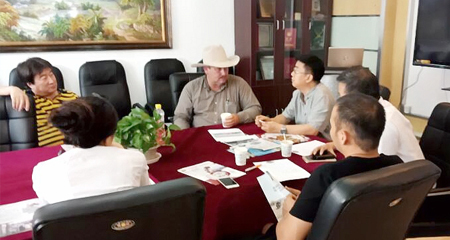 It could, therefore, utilize Guangdong's high-quality production capacity, large amount of capital, advanced technologies and rich experience to achieve mutual benefit and win-win cooperation," she said. Sun said China will continuously improve the quality, and increase the benefits, of its cooperation with Kenya, as well as enrich investment and financing methods. "I urge the Chinese enterprises in Kenya to adhere to the principles of sincerity, practical results, affinity and good faith. They should also uphold the values of friendship, justice and shared interests when cooperating with their Kenyan partners," she said. Sun said the embassy would give full play to the complementary advantages of both sides and improve the added value of products, thus driving the transformation and upgrading of China-Kenya cooperation. Yu Jinfu, the vice-mayor of Huizhou, Guangdong, said her city attaches great importance to developing friendly relations and cooperation with Kenya. "Kenya and Huizhou have strong resource endowment differences, industrial development gradients and economic cooperation complementarity. This requires us to continue to strengthen communication, enhance understanding, open up markets and achieve mutual-benefit and win-win results," he said. Yu said the newly opened Huizhou Economic and Trade Representative Office in Kenya shouldered the important task of deepening the all-around cooperation between Huizhou and Kenya and the entire East African region. "We are willing to join hands with our Kenyan friends to further deepen and broaden cooperation between Huizhou and Kenya," he said.